Here's a look at my May schedule at The Weather Network. Of course, depending on what area of the country you live in, you may not be able to see me at these times as TWN runs five different feeds: British Columbia, Alberta, GTA, Atlantic and National. 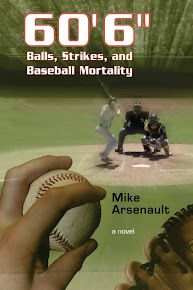 Also, for those of you in the GTA, I have a book signing for my novel 60'6": Balls, Strikes, and Baseball Mortality at Chapters in Oakville (Oakville Town Centre , 320 North Service Rd W.) on May 11 from 10 a.m. to 1 p.m. Come on out and say Hello! May 4 and 5 - 4 p.m. to 9 p.m.
May 11 and 12 - 4 p.m. to 9 p.m.
May 16 and 17 - 2 p.m. to 7 p.m.
May 18 and 19 - 4 p.m. to 9 p.m.
May 20 - 2 p.m. to 7 p.m.
May 22-24 - 2 p.m. to 7 p.m.
May 25 and 26 - 4 p.m. to 9 p.m.
May 29 - 2 p.m. to 7 p.m.